With tech buses becoming a fixture in San Francisco, Castro residents are upset one of those bus stops will take up five parking spots. SAN FRANCISCO (KGO) -- Next February, tech buses will become a permanent fixture in San Francisco. Regardless, residents in the Castro District are upset by the location of one of the shuttle stops at 18th and Castro streets. At that location, the tech bus stop will take up five parking spots and if anyone is caught parking there Monday through Friday from 6 a.m.-10 a.m., the fine will be over $100. Most people in San Francisco think the big tech shuttles only use Muni bus stops for pick up and drop offs. Many never realize these shuttles also stop at some white and yellow zones that have parking meters. The SFMTA is holding a hearing today on changes to a controversial program that allows corporate shuttles to use Muni stops, it could mean fewer parking spaces in San Francisco. San Francisco resident Will Garcia said, "I drove up, parked, put money in the meter, came back out and then I looked at the sign afterwards." He could have gotten a ticket because there is a large white zone on Castro Street near 18th. Few bother to read the shuttle-bus-only signs. San Francisco resident Avi Goldberg thinks this is a problem because "there is less and less parking spaces, especially here in the Castro now." It bothers others that this shuttle bus stop is so close to one of the busiest drug stores in San Francisco. Garcia said it's a problem "for people like us, who really fight for a parking spot, either getting medications or picking up our kids." 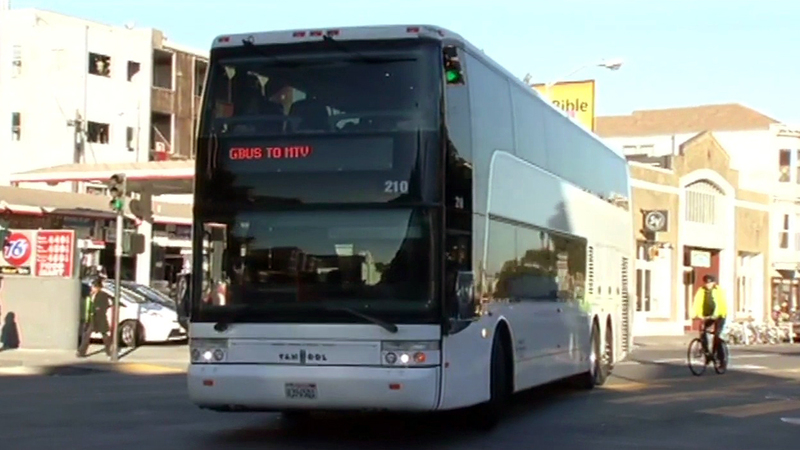 But the San Francisco Municipal Transportation Agency says there are now 125 of these designated stops used by shuttle buses that take more than 8,500 people to and from tech companies on the peninsula. "I have absolutely no problem with that at all because most of the stores don't open until 10 a.m. anyway and I think to get all the cars off the roads for the shuttles, I always thought that was a good thing," Castro District resident Chris McMahon said. While this shuttle stop in the Castro has been part of a pilot program, it's supposed to be a permanent fixture in February. Still, the MTA says there is always room for discussion. "It really takes cars off the streets, it reduces gas emissions and it does a number of things that make our transportation network better," Paul Rose, a spokesperson with the MTA, said. "We're open top their feedback, we're open to their input and we want to make sure we're reaching as many people as possible." In the past 18 months the city has collected $2.5 million for the right to use these shuttle bus stops.